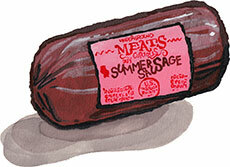 Summer Sausage: Lynette's Favorite for sale. Buy online at Zingerman's Mail Order. Gourmet Gifts. Food Gifts. Lynette Christian is a service star in our Service Center and a concierge in our Business Gifts department at Zingerman's Mail Order. It's been no small feat working here at Zingerman's and maintaining a low carbohydrate diet, but treats like this Summer Sausage from Underground Meats make my life a whole lot easier. Joyous was the moment I first tried this decadent, snackable sausage made with a mix of pork and beef—I knew it was going to go into heavy rotation on my short list of nosh that I get really excited about eating! I look forward to its soft, pleasant texture and sweet yet smoky flavor, subtly highlighted with notes of mustard seed, coriander and allspice. This isn't your run-of-the-mill summer sausage. It is quite entirely unlike any other I've tasted before. It has a permanent place on any cheese board I put together. As a matter of fact, it’s always the first thing to go amidst the other salamis and goudas and Gruyeres—I've had to start ordering two just to make sure there's enough to last the duration of the party! My absolute favorite way to eat this summer sausage is sliced, paired with our Zingerman's Cabot Cheddar, and dipped in a bit of Fallot Dijon mustard. Even beyond the great flavor, Underground Meats is a fantastic company and I am glad to support their tasty work. They were founded on the principle of sourcing sustainable and ethically raised meats and work super hard at developing a network of farmers to supply them, using only farms from the Upper Midwest. For their summer sausage they work with a farm in Northern Illinois that is so small they don't even have a farm name!